Belize NMS: Northeasterly airflow will become more moist and unstable later tonight. 24-hour forecast: Sunny with cloudy spells today along with a few showers and isolated thunderstorms over the south at first, then over inland and northern areas after mid-morning. Cloudy tonight with some showers or thunderstorms mainly along the coast. General Outlook: (Mon & Mon night) Cloudy with some showers, thunderstorms or periods of light rain over most areas, but especially over northern and central portions of the country. Today NE 5-15 kts Choppy 3-4 ft ISOLATED SHOWERS AND ISOLATED THUNDERSTORMS, INCREASING THIS EVENING. 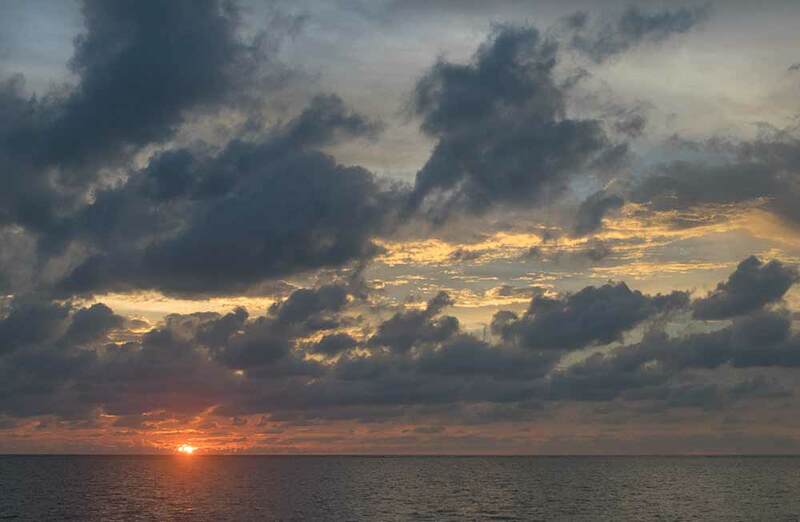 Tonight NE 5-15 kts Choppy 3-4 ft A FEW SHOWERS. Tomorrow N-NE 5-15 kts Choppy 3-4 ft SOME SHOWERS, THUNDERSTORMS OR LIGHT RAIN. Outlook NE 5-15 kts Choppy 3-4 ft SOME SHOWERS AND LIGHT RAIN. Broad surface ridging extends SSW from a surface high centered north of the area. An upper level high is centered over the SW Caribbean near 12N80W. Broad upper level anticyclonic wind flow spans the entire area. Gentle to moderate trades will prevail across the Caribbean through early tonight, except for fresh to strong trades in the south-central sections. A cold front across the Straits of Florida to the Yucatan Channel tonight will move slowly SE overnight and become stationary from central Cuba to just NE of Belize early Sun, and gradually dissipate through Sun night. The fresh to strong trades in the south-central Caribbean will diminish to moderate to fresh trades Mon through Thu. Long period NE swell from Tropical Storm Oscar will begin to move into the northern waters of the tropical N Atlantic and through the Caribbean Passages tonight and dominate seas through Mon afternoon. On Ambergris Caye this morning the sea around our barrier reef is calm with a breeze from the North. Despite the sunrise photos appearance the morning is sunny. The high temperature today will be in the upper 80's. It does look as if that ITCZ area near Panama I mentioned yesterday is developing into a storm. There is some mid level cloud pushing up into southern Belize this morning and high level cloud from the SW clashing with the easterly Caribbean clouds to produce significant rain in Toledo and a little up north. 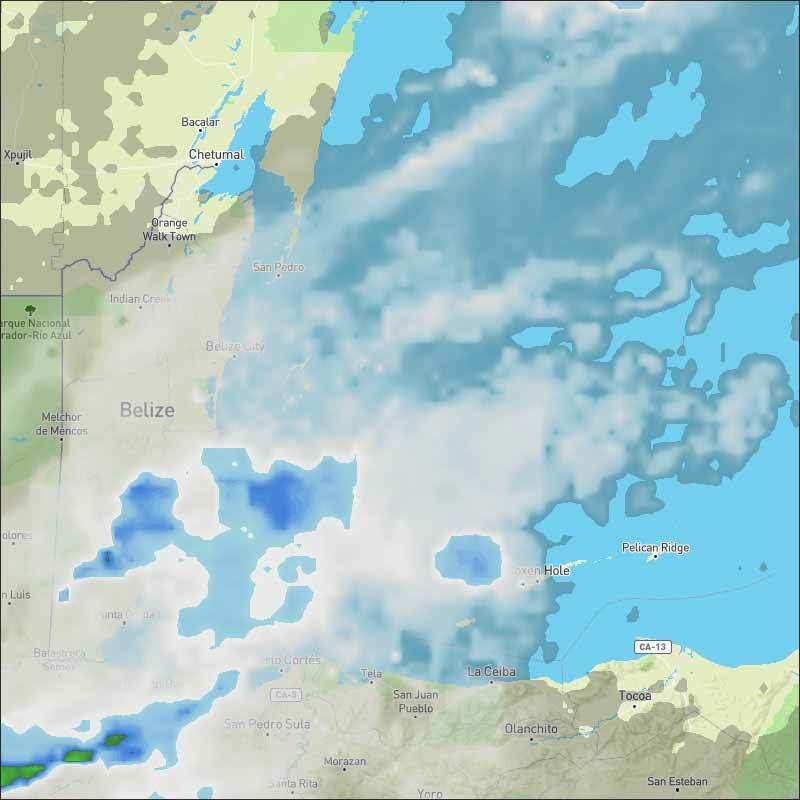 Looks like today is turning into a mixed weather day, some heavy rain down south, rain later in central and even north Belize later today, otherwise a mixture of sunshine and cloud. The Cloud and rain picture. All sorts of cloud movement over Belize right now, Caribbean air from the ENE with lines of cloud in it, mid level cloud pushing up from the south, possibly as a result of that large, very active ITCZ area near Panama that might develop into a storm, then there is the thin high level cloud from the SW and there is a little trying to come down from the NW. All getting complex, so could cause thunder and rain later today, is causing rain down south presently.